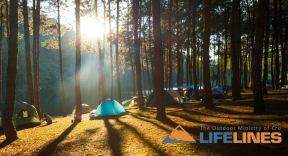 Lifelines is an outdoor experiential learning ministry of Cru. Our purpose is to help people grow in relationship with God, in relationships with each other, in character and in leadership. Our main audience is college students, though we also take high school students and faculty on trips. The outdoors has historically been an effective venue to connect with people, and with our increasingly media-saturated culture it can be even more transformational. We resource Cru with the vision of seeing students’ lives changed through experiencing Jesus and biblical truth on adventures. We take people on outdoor trips like rock climbing, snowshoeing, or whitewater rafting- not just for adventure sake, but to help challenge how they think about themselves, others, and God. Our programs encourage participants to take physical, emotional, and relational risks, placing them in a position to grow. It is our goal for people to experience the grace and truth of the Gospel as they connect with each other and God. The Northeast team is based in Plymouth, NH, in the White Mountains area. We currently have 8 full-time Lifelines staff and 1 part-time staff on our team. We serve colleges all throughout the Northeast, from New York to Maine, and help the local Cru campus ministry at Plymouth State University.